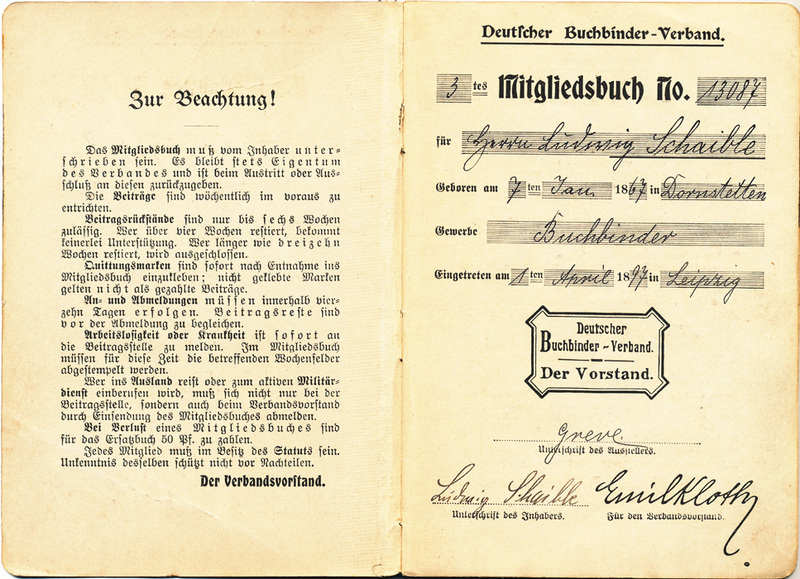 Several years ago I was able to acquire the German Bookbinders' Guild membership book of a certain Ludwig Schaible. 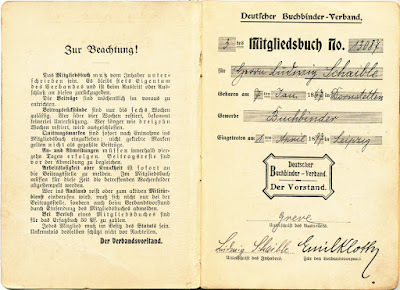 Herr Schaible was born on the 7th of January 1867 in Dornstetten, Germany and joined the Federation on the 1st of April, 1897 at the age of 30 in Leipzig, Dornstetten is in the northern part of the Black Forest closer to the Rhein whereas Leipzig is in Saxony, a bit south of Berlin, quite a distance apart and an indication of mobility in the trades.In this his third membership book, he is shown to have worked in Hamburg Altona from 1913 - 1918 as the location where these dues were paid was also recorded. 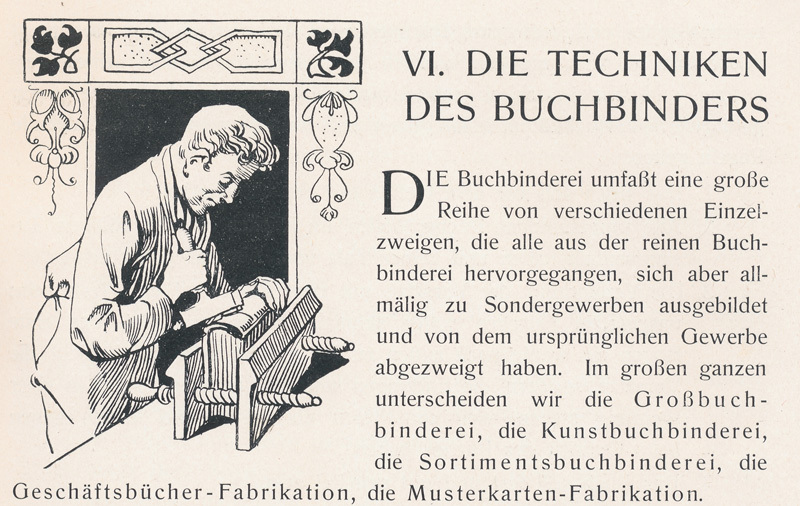 Now known as the Bund Deutscher Buchbinder Innnungen (BDBI) or Federation of German Bookbinding Guilds it was formed in 1880 to support the trade and those practicing it. 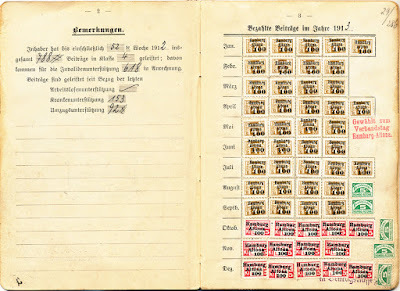 The membership books were used in all trades and used to record the contributions made for dues, insurance, and other expenses related to working with these recorded using stamps. 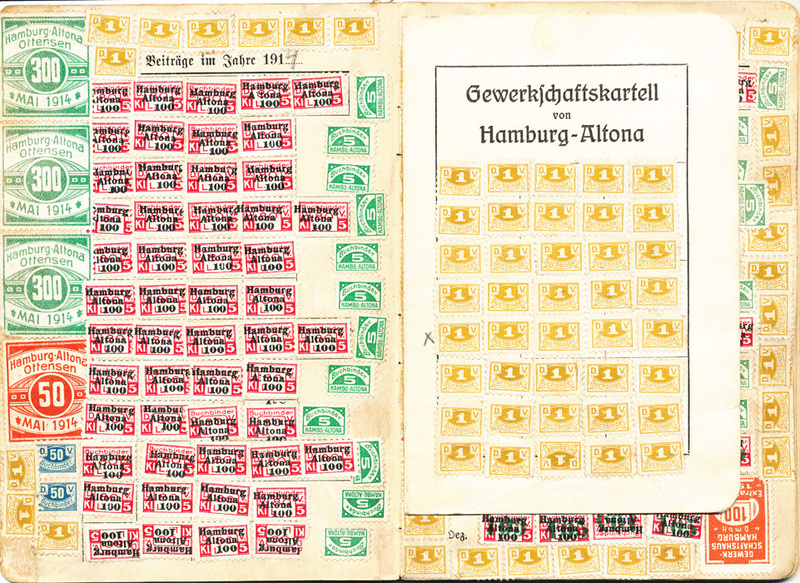 Below are the cover and a selection of page spreads depicting these stamps. 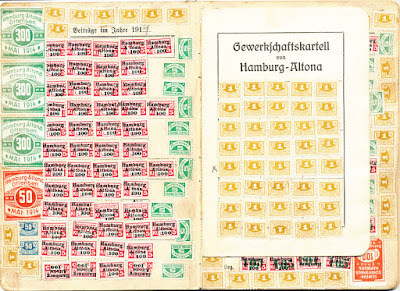 The small notice below from the Allgemeiner Anzeiger für Buchbindereien, Vol 22, 1907 also gives an indication of how these stamps were collected and accounted for. 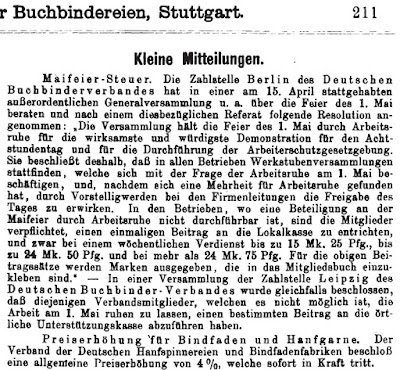 In this case for non-participation at the May Day celebration by those from shops that could not close for the day. Those earning 15 Marks/week were asked to pay 25 cents and for those earning over 24 Marks the fee was 75 cents. 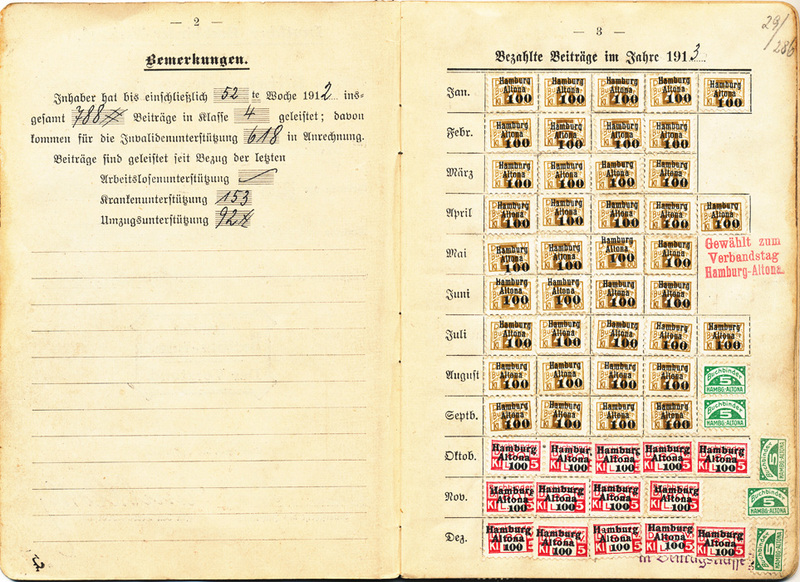 Stamps for the appropriate amount were then glued into the membership books. 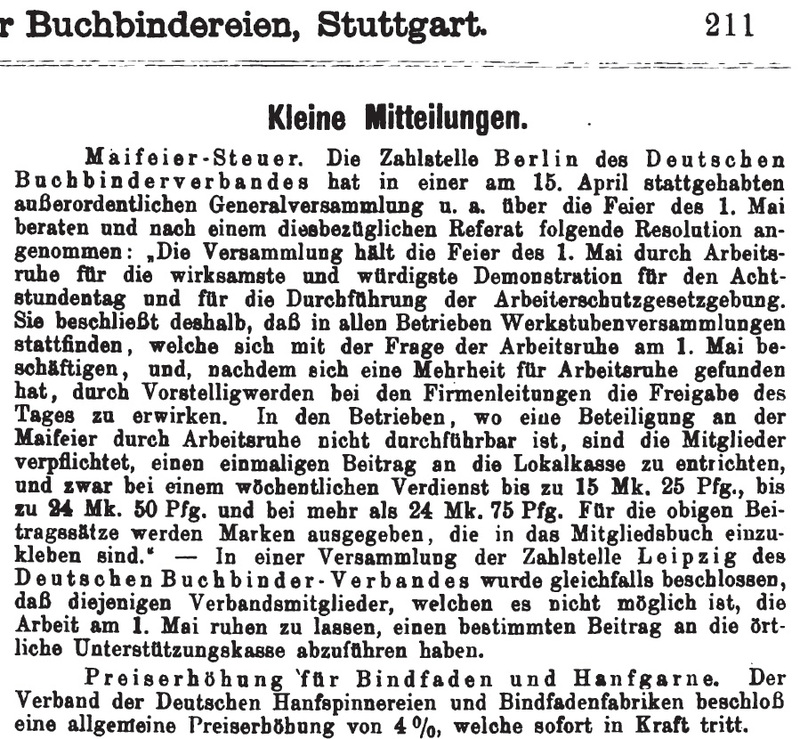 As an aside the notice also indicates that the Federation of German Hempspinners and Sewing Thread Manufacturers agreed to a general price increase of 4% for their products effective immediately. This article continues part I. 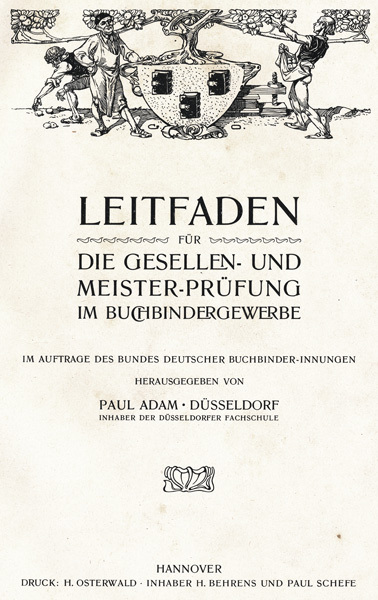 In his introduction to Adam’s Leitfaden für die Gesellen- und Meister-Prüfung im Buchbindergewerbe (1904) Obermeister (Grand Master) Slaby of Berlin, Chair of the Federation of German Bookbinding Guilds, notes that in the short time since the adoption of (not yet mandatory) state regulated examinations for journeymen and apprentices, the need to formally define these examinations and to strive towards uniform action in the bookbinding field has revealed itself. 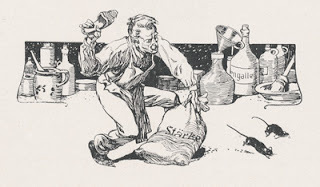 While the hands-on works were with few exceptions quite good, the same could not be said for the more theoretical aspects of the profession where there were severe shortcomings, with the oral examinations being even worse. 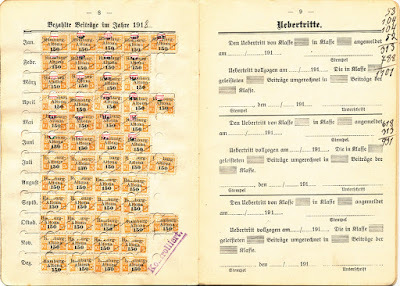 Based on these observations the Masters in the Guilds and the heads of the Examination Boards decided in 1902 to create a guidebook (the Leitfaden) for these examinations, a challenge taken on by Paul Adam of Düsseldorf. Adam took it upon himself to expand this guidebook well beyond the minimum requirements of defining the core questions apprentices and journeymen would need to answer in their respective examinations. By adding additional subjects Adam sought to provide the basis for a well-rounded and professionally aware bookbinding professional. This process of life-long learning would begin during the apprenticeship and be built upon during the binders journeymen years. Subjects added to this guidebook include a history of the book (and bookbinding), a history of the bookbinding trade. The complete contents were listed in the previous post. Views of the bookbinding trade school of Badersleben in the Harz from the early 20th century. 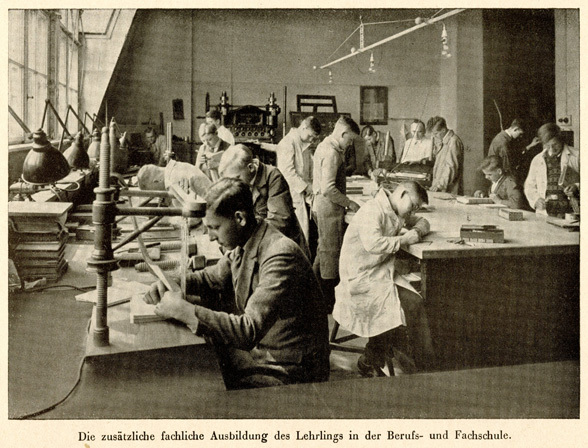 Shown are the typesetting room and the bindery. 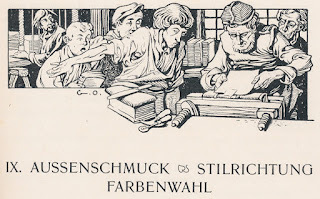 While the original intent was to publish separate volumes for apprentices and journeymen, Slaby notes that the Federation became convinced that the sooner apprentices began to familiarize themselves with the knowledge required to become a master, the easier it would be for them to progress through the ranks and become a master in their own right. 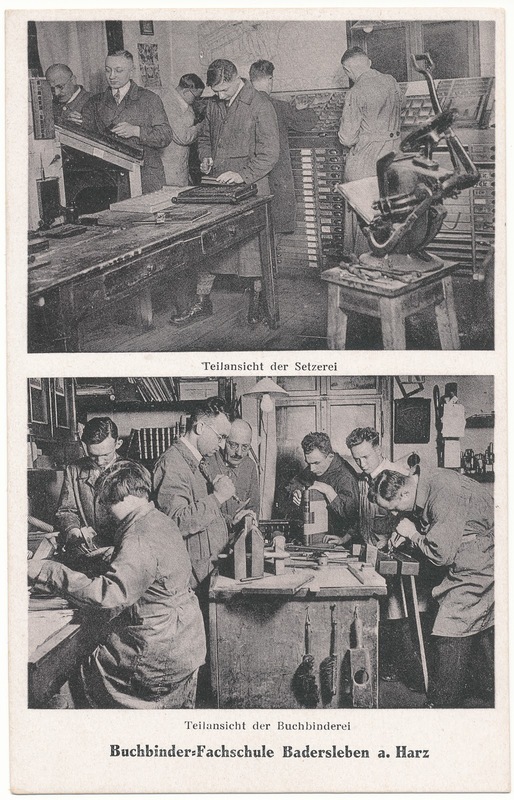 As a result, trade schools (attendance at which was mandatory) were strongly urged to adopt this guidebook, and masters encouraged to impress its value upon their apprentices. At the same time members of the examination boards were told to familiarize themselves with the content of the book in the knowledge that those being tested by them would no longer “quake and be fearful” as they would be better prepared. Overall, the tone of the guidebook was professionally stimulating, without becoming overly pedantic so that binders of all levels would want to consult with it regardless of their rank. 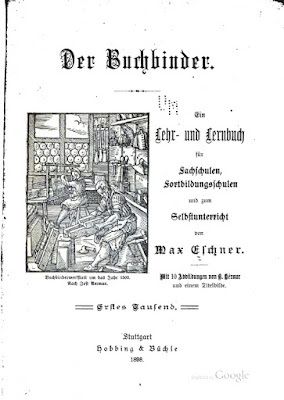 This guidebook was not a bookbinding manual, giving only superficial attention to the details of particular binding styles but it was also more than a mere introduction to the field as it also contained details about the structure of the guilds, the ranks one could attain (apprentice, journeyman, and master) as well as sample questions for those respective examinations. 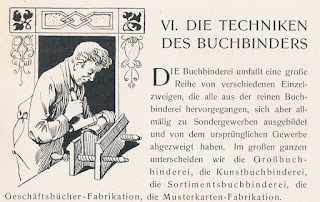 While Adams' manuals Der Bucheinband: Seine Technik und seine Geschichte (1890), Die praktischen Arbeiten des Buchbinders (1898), also published in English as Practical Bookbinding by Scott, Greenwood & Co. (London) in 1903 did not formally address the structure of the trade they did describe the work of binderies and their outfitting. 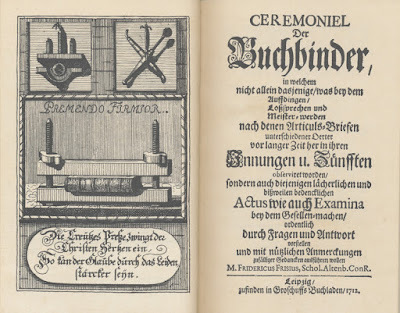 With the formalization of the bookbinding trade, manuals began to appear that incorporated many of the aspects of this first guidebook, in particular sections on the history of the book and trade, “materials science,” estimating, sample questions in preparation for examinations. 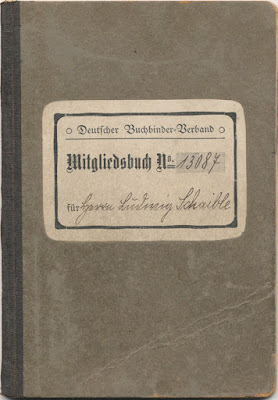 An example of this type of manual is Heinrich Lüers’ Das Fachwissen des Buchbinders that appeared in numerous editions (Deutsche National Bibliothek has 1939 as earliest edition). At the same time more pamphlet-like introductions to the bookbinding trade continued to be issued, often by the same authors. Making pastepapers and marbling in trade school. Integral to the training of bookbinders of all levels were also the trade schools that complemented the hands-on on-the-job training provided in the individual binderies, offered courses for continuing education, and served as venues for the trade examinations. The trade schools also provided coursework in social studies, math (especially as it related to the trades, including estimating), and other subjects, something that was critical especially when apprentices were younger (as young as 13). This need for an “equalizer” was still evident when I served my apprenticeship in Germany from 1985-87 when my trade school class included those with university qualifications as well as those who left school early to learn a trade and ended up with publishers stapling magazines (also part of the hand bookbinding trades) all of whom needed to pass the same national examinations. 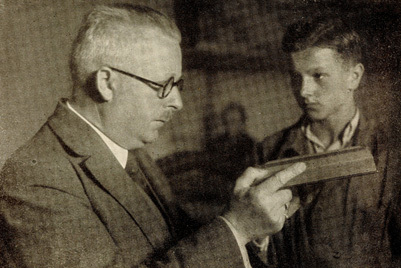 Special courses in working with commercial grade high-speed folding machines and cutters were also included to provide a bridge to the industrial binding trade. While the trades were historically described in catechism-like works such as Friese's Ceremoniel der Buchbinder from 1712 (below), it wasn't until the turn of the 19th century for more complete and trade-oriented works to appear, works that laid out the history of the trade and its requirements in detail. 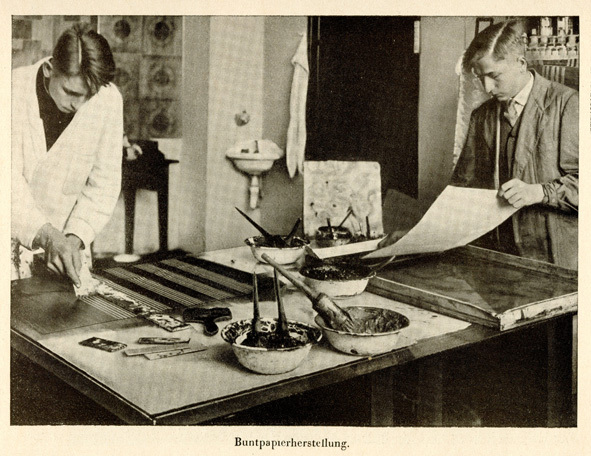 Paul Adam (1849-1931) was one of the leaders of the German bookbinding trade during the late 1800's until his death. He was the author of several seminal "modern" manuals written for the trade, among them Der Bucheinband: Seine Technik und seine Geschichte (1890), Die praktischen Arbeiten des Buchbinders (1898), also published in English as Practical Bookbinding by Scott, Greenwood & Co. (London) in 1903, Die Kunst des Entwerfens für zeichende Buchbinder (1917). All these works were reprinted numerous times and issued in various editions. 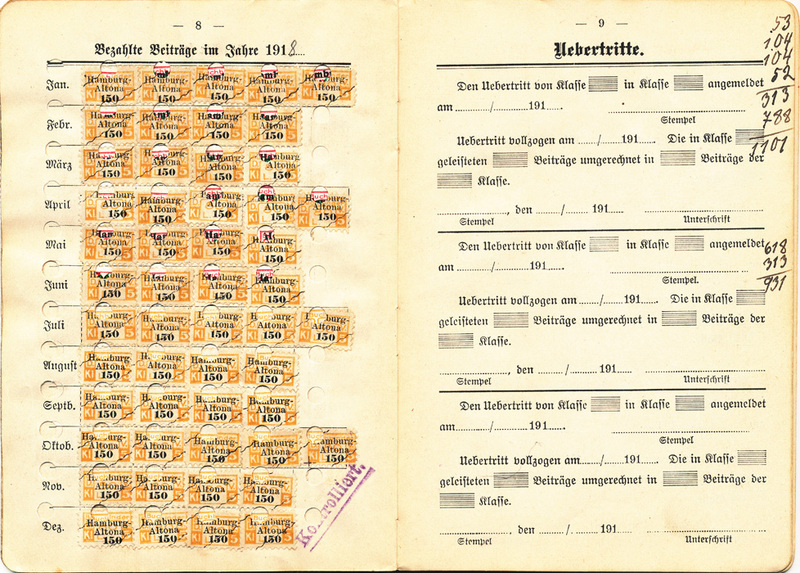 Dates refer to the copies in my personal collection. 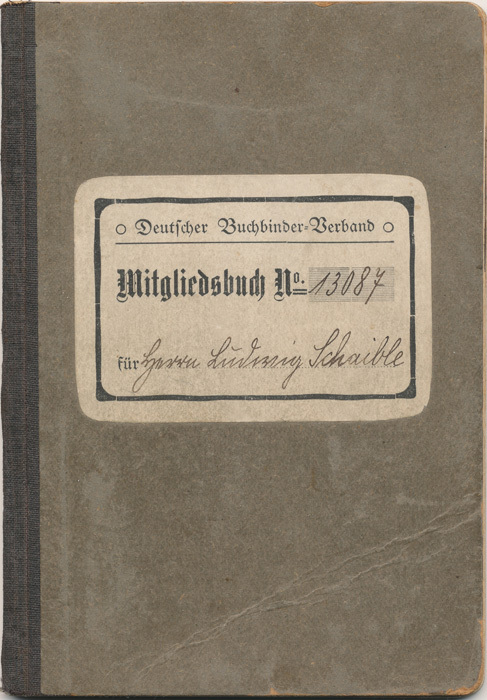 His autobiography Lebenserinnerungen eines alten Kunstbuchbinders was published by the Meister der Einbandkunst's Verlag für Einbandkunst (Leipzig) in 1925. 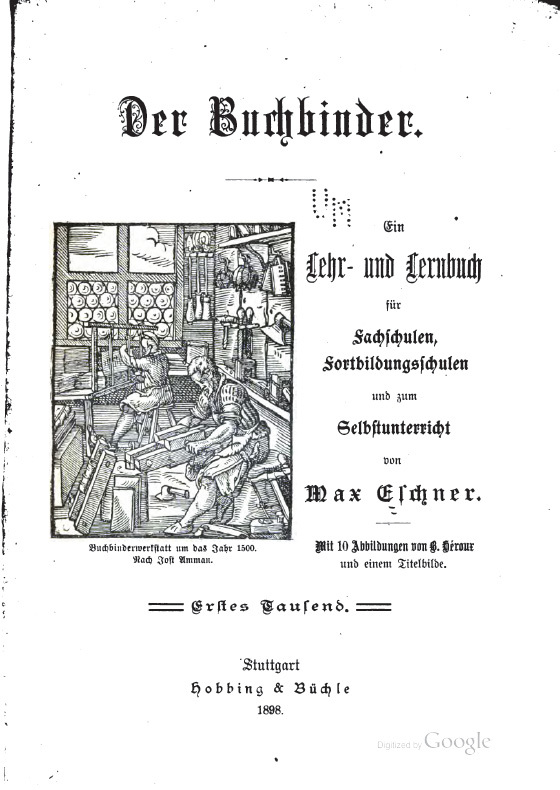 Heading for chapter V, "Materials of the Bookbinder." Depicted are a [poorly constructed] and [well constructed] book. Also included were the required theoretical knowledge and hand skills for apprentices, journeymen and masters so that these would know what was expected as part of a nationally coordinated education and examinations process for the trades. These last sections were perhaps the most important as successful completion of the exams for the various levels would determine the career path of the individual. Advertisements for many of the vendors of the time round out the volume. 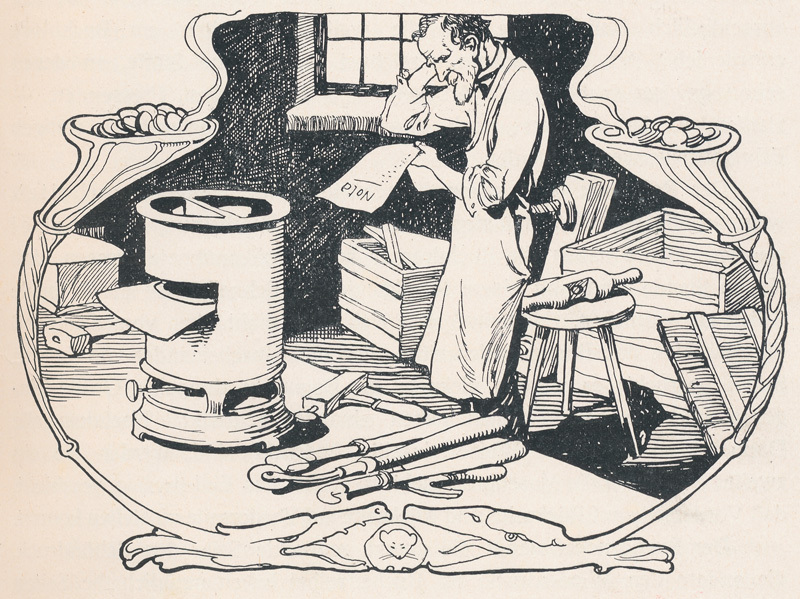 Illustration ending chapter 4, "Tools of the Bookbinder." 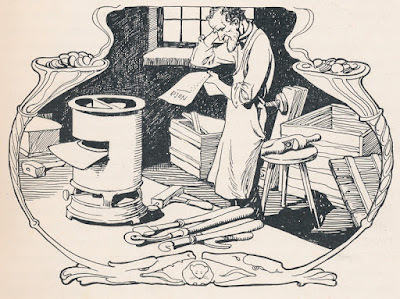 In successive posts I will describe some of these sections in greater detail as they would be very useful topics to cover in updated form by programs teaching bookbinding and the book arts (or most any craft) today. To help ensure at least a chance of success, crafts/tradespeople must not only understand their manual skills but also the fundamentals of calculating costs, accounting, and the other business aspects of what is a beautiful craft and trade. Below are some of the other illustrations of this work depicting a great deal of Jugendstil charm. 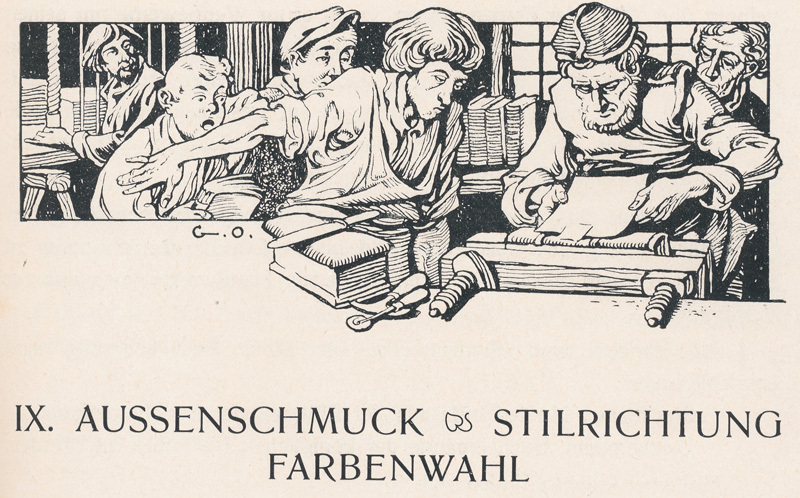 Illustration for chapter VI, "Techniques of the Bookbinder." Illustration for chapter IX, "Decoration." Final illustration depicting rats being driven away from a bag of starch. From the muse to the binder. a circular blade at bottom. See also part II of this article.